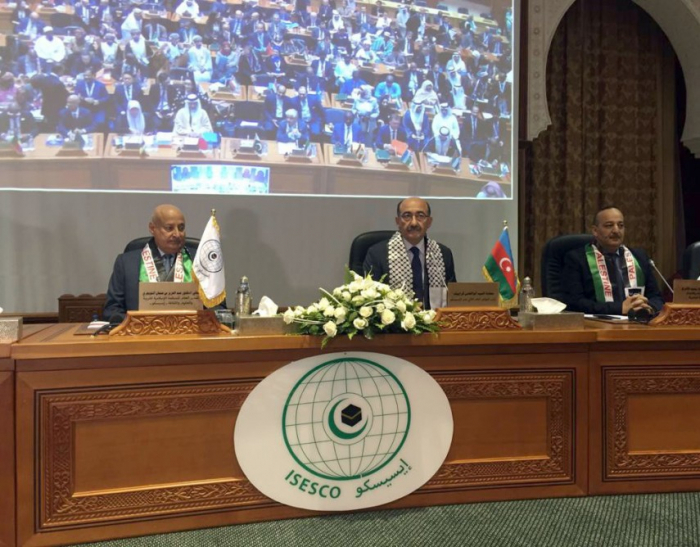 Azerbaijan’s Minister of Culture Abulfas Garayev is attending the 13th session of the Islamic Educational, Scientific and Cultural Organization (ISESCO) General Conference in Rabat. Azerbaijan joined this year’s session as the chairman of the 12th General Conference of the Organization. The Conference’s Programmes Committee will discuss the General Conference’s rules of procedures, the implementation of decisions made on various issues at the 12th session of the organization, the Progress Report of the Director General for the years 2016-2018, the Draft Medium Term Strategic Plan for 2019-2027, and the Draft Three-Year Action Plan and Budget for 2019-2021. Addressing the session, Minister Garayev hailed cooperation between Azerbaijan and ISESCO. He highlighted the Baku Process and the 6th Baku International Humanitarian Forum to be held in the capital of Azerbaijan on October 25-26. Garayev drew the audience`s attention to Azerbaijan`s activities during its presidency of ISESCO, adding that one of its important features was the signing of a cooperation agreement between ISESCO and the International Organization of Turkic Culture (TURKSOY). Azerbaijan assumed presidency of the ISESCO General Conference in November 2015, which will end this year.